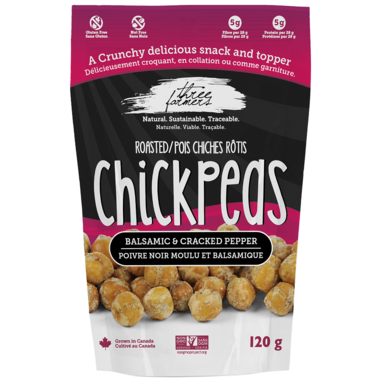 These Crunchy Roasted Chick Peas by Three Farmers can be used as a delicious snack or thrown on your favourite foods as a topper! These chickpeas are manufactured to be nut free, gluten free, non-GMO, and delicious! The perfect snack for school pleases both kids and parents. Find more school safe snacks on our blog, The Well! Ingredients: Chickpeas, seasoning (maltodextrin, salt, evaporated cane sugar, spices, balsamic vinegar, yeast extract, white distilled vinegar, citric acid, corn starch, sunflower oil, spice extractive), and camelina oil. very good but not enough vinegar flavour. not spicy like others have said. just peppery. Too hard, too crunchy. I like the seasoning, but the chick peas themselves tasted stale. I wouldn't buy them again, but my husband liked them. Tasty for putting on salads or just eating for a quick protein-filled snack break. I would like just a bit more flavour. Good, clean snack. A great snack or a healthy protein on your salade, it tastes good, almost addictive. I just wish there were a little more in the bag, because it dissapears so fast. Love these, one of my fav snacks. Wish they came in a larger bag! For the love of God, don't spill them into the ocean!! My mouth will recover, the Earth may not. Way too over peppered and dry,to the point where it hurts. Can't for the life of me taste the balsamic,either. This is unfortunate, as the sea salt and lime ones are really nice. These are a miss. Not really a big fan of these, they get extremely dry when eating more than 3-5 at once, it actually became a competition between me and my friends to see who could eat more at once lol. They have good flavour and are much better for you than regular snack foods. Although I ate the whole bag, I definitely won't be buying them again, you be the judge. Very tasty little snack to get you to supper. Nice and small to take to work! Good afternoon snack at the office! Absolutely yummy, and very filling! However, very spicy - may not be for you if you are not fond of spicy foods. Taste and texture: hard, salty dirt pellets. Tossed them. Would have given no stars, but not an option on rating. Love the crunch, but the pepper is overwhelming!! These are good and spicy. My son-in-law is always saying he likes 'flavour' in his food - even he said they were hot -then he finished the bag! Love that you get nutrition in your snack -no guilt. I really like these. They're nicely flavoured and they're perfect in caesar salads. There is a surprisingly large amount as well. I will definitely purchase again.